SOLD Britannia Prout Divisa Suit Temporibus Anglo-Saxonum in Autumn Sale! Title: 'Britannia Prout Divisa Suit Temporibus Anglo-Saxonum'. 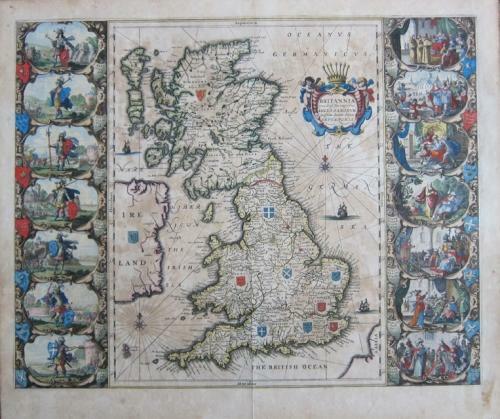 One of the most decorative maps of the British Isles available. Shows the Saxon Kingdoms of Britain, their boundaries and coats of arms. The map has borders down each side made up of seven finely engraved vignettes. Very similar to the Blaeu version, but with compass lines radiating across the seas and the addition of an armorial on Ireland. In good condition with overall toning and some small paper repairs at the margin. Would frame well. Faults are reflected in the price.